Published by Cyril Huze December 20th, 2016	in Builders, Customs and Editorial. From a Benelux builder and reader…. That is the nicest tank I’ve ever seen on a Victory! The wheels, rear tire and paint job aren’t my cup of tea, but that’s the easy part. The metal work, the lines and overall stance is great. 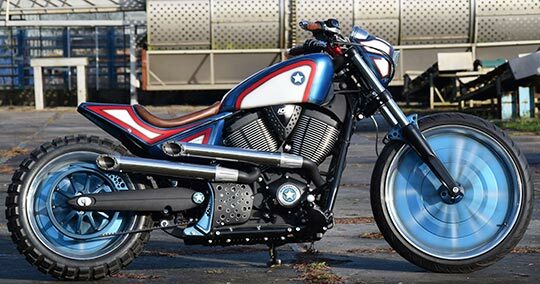 If Victory is listening…..I would buy this in basic black with mid controls, spoke wheels and nice street tires. My favorite parts are the pipes. The gas tank looks like a slightly larger Sportster tank. The seat and rear fender add a nice touch too. Very nicely done. I don’t much care for theme bikes and I would not have got the CA connection if I hadn’t read the title. That is a good thing. Now THAT looks like it would be fun to rip around on, and very nicely done to boot.